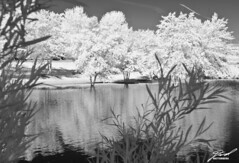 I had my damaged D2X (the low pass filter was scratched somehow during a shoot) converted to an IR only camera. I took it out for the first sets of photos at a local shopping center frequented by geese. None of these were intended to be great images, but they were a first test of the camera and my first IR shots. I promised to post some early photos so my buddies could check out the D2X as an IR camera, so these are for them.